The definition of who is a human subject determines whether or not the research must be submitted to the IRB for review and approval or not. The FDA regulations define a human subject as an individual who is or becomes a participant in research, either as a recipient of a test article or as a control. A subject may be either a healthy human or a patient. The difference between these definitions relate to the FDA's role in regulating investigational test articles (drugs, biologics or devices). If a person receives an investigational test article, then they are human subjects, regardless of the study design. Therefore, treatment with an investigational agent in a protocol designed to treat a single individual is enough to sufficient that individual a human subject even though generalizable knowledge will not result. Means that human subjects research involving decedents is not covered under the Common Rule. Decedents are still covered by HIPAA's Privacy Rule. Research that includes both decedents and living subjects must be reviewed by the IRB. If the research only pertains to decedents then the investigator does not need IRB approval but must submit a HIPAA attestation to the IRB prior to conducting the research. Includes both physical procedures by which information or biospecimens are gathered and manipulations of the subject or the subject's environment that are performed for research purposes. Includes information about behavior that occurs in a context in which an individual can reasonably expect that no observation or recording is taking place, and information that has been provided for specific purposes by an individual and that the individual can reasonably expect will not be made public (for example, a medical record). Private information must be individually identifiable for which the identity of the subject is or may readily be ascertained by the investigator or associated with the information. This definition is different from the definition under the HIPAA Privacy Rule. Who is not a human subject? It is often unclear to investigators whether or not an individual should be considered human subject. 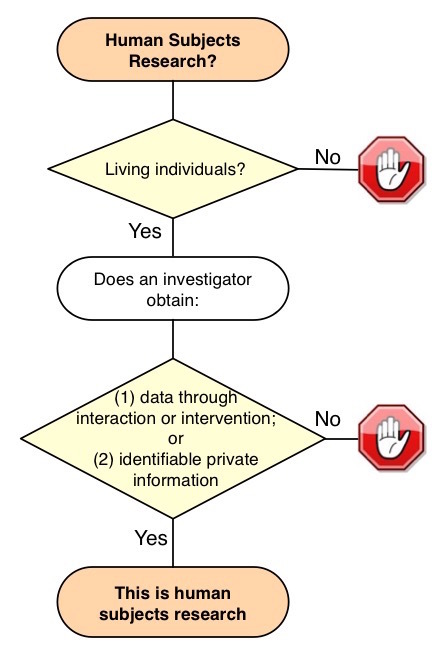 The following are common scenarios where individuals are involved in the research but their involvement does not fit the definition of human research subject. The definition of human subject includes the requirement to be "living individuals". This includes individuals who perform study procedures, make measurements, or perform assessments of study subjects. Their role in the research is to serve as collaborators, not subjects. For example, a teacher or driving instructor who completes an assessment of the study subject is a third party. However, if the investigator also obtains information about the teacher/instructor (number of years of teaching experience, age, qualifications, etc.) then they become secondary research subjects. De-identified data and individuals who are not readily identifiable are not human subjects. A dataset may contain HIPAA identifiers but might still not be readily identifiable. For example, data obtained from the PHIS dataset or Medicaid is not considered readily identifiable even though there are birth dates because the data comes from the entire nation. The subject of the research could be about institutions, programs or hospitals and not about the individuals who are in those programs. For example, a survey could inquire about a training program, hospital or other institution and requiring factual information that doesn't contain information about individuals. In this case, even though a person fills out the questionnaire, the research is not about them as individuals - its about the program in which they work. The investigator must justify the need to gather identifiable data from secondary subjects. For example, a relative could be identified as Maternal Uncle 1 rather than by name. Who will introduce the secondary subject to the research? The investigator should not contact these individuals without an introduction from the participant or parent of the participant? How will the confidentiality of the index subject's private information be protected? The informed consent form must include statements on the signature page to make clear that consent is being granted for all research participants. If family members will not be present, a waiver of consent and HIPAA Authorization will be needed.